Riding itself is a workout, so it may seem that a pre-ride workout is a little bit of an overkill. However, I’ve found that warming up my muscles before I get on the horse results in a much more pleasant and productive ride. I like to ride in the morning, so this workout is also about waking up and taking the kinks out of sleepy muscles. Usually I do this routine, then I have a cup of tea and a light, but high-protein breakfast before heading out the door. 25 of ’em, right off the bat, just to get the blood flowing. I actually am not sure what these are called, but what I do is stand up with my arms straight out to the sides. I then lift my leg straight and twist to touch the opposite hand to my toes. Alternate legs and arms, 10x. 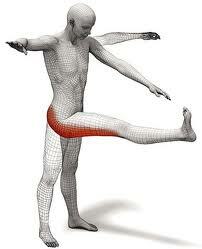 While standing, lift leg straight and touch toes with opposite hand, just like this creepy diagram shows. Nothing crazy, just a few to warm up the legs. I do maybe 15 or so. I go through a quick sort of modified sun salutation routine that focuses on opening up the hips and stretching out the thigh and back muscles. Starting in downward dog, I move out to plank, then lower myself down to chaturanga. Then I push myself up to cobra and then back up to downward dog. Next, I lift one leg straight up behind me and then bend it at the knee. I circle that leg a couple times in one direction and then in the opposite direction to open my hips, then hold the position for a stretch. Hip opener stretch in downward dog. After that, I straighten the leg out behind me again and bring it forward between my hands for a low lunge. 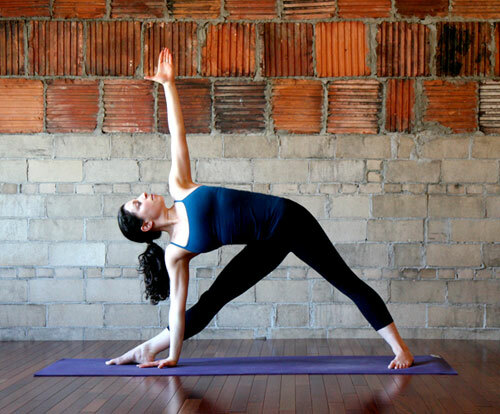 Next, I lift my arms for a high lunge, then move into warrior 2, triangle pose, and twisting low lunge. From the twisting low lunge, I place both hands down on the floor inside the front leg for a really nice hip and hamstring stretch. If I’m feeling particularly flexible that day I go down on my forearms. An amazing stretch for your hips and your hamstrings. From here, I go back into downward dog, go through another plank-chaturanga-cobra routine and then back to downward dog to repeat the sequence with the other leg. After all of this is done, I lay down on my back and go into happy baby pose, and then pull my knee across my body for another twist. Return to happy baby pose again, and then repeat with the opposite leg. Happy baby pose makes for happy hamstrings when you’re in jumping position. This twist is so wonderful on your lower back. To get my core warmed up, I do 25 Bicycle Crunches followed by 25 hip lifts. Then I repeat that. To finish off the workout, I end with this intense but lovely stretch for my gracilis muscle. I wrote before in my post on flexibility about how tight that one can get. When I found this stretch, I noticed a big difference in the efficacy of my leg while riding. I have more flexibility to lengthen and wrap my leg around my horse, and this gives me more stability to hold myself in the saddle. It also allows for more suppleness throughout the interior of my thigh, so my legs don’t become so fatigued while squeezing my horse forward. On your knees, move them as far apart as they will go. Keeping your lower back flat, bend forward from the hips (like you do in jumping position) and come forward to rest on your forearms. If you’re able to, come even further forward and make a pillow with your hands to rest your head on the floor. Breathe. This is an intense stretch, but if you relax into it for a moment, you will feel those inner thighs loosen up. This routine isn’t set in stone. Sometimes I do more of something, sometimes less. Sometimes I leave some of this out, sometimes I add other things, especially different yoga poses if I feel particularly tight somewhere. All throughout, I throw in little movements and stretches as it strikes me (like a neck roll or an ankle roll). The point is just to get limber, however works best for you. This routine offers a little bit of cardio to get the blood flowing and then stretches everything out, focusing on the areas that tend to become the tightest while on the horse.